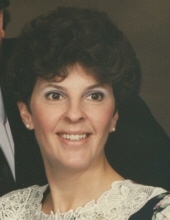 GERMANTOWN HILLS – Joanne R. Bergman, 72, of Germantown Hills passed away at 5:45 AM on Friday, February 1, 2019, at OSF St. Francis Medical Center. Joanne was born on October 5, 1946, in Peoria to William Joseph and Helen Jane (Benzies) Rogers. She married Michael D. Bergman on September 7, 1990, in Peoria. He survives. She is also survived by four siblings, William Scott (Donna) Rogers of Germantown Hills, Richard Allen (Suzanne) Rogers of Bartonville, Debra Sue (Gary) Tiffany of Arizona, and Barbara Kay (Stan) Presley; several nieces and nephews; her stepchildren, Staci (Mitch Atherton) Bergman-Maricle and Jason (Laura) Bergman; several grandchildren; and two great-grandchildren. She was preceded in death by her parents and her late husband, Rudy Leos. Joanne was a 1964 graduate of Richwoods Community High School, where she was a Royalette. She worked for Peoria Travel Company and later owned her own business in Peoria Heights, The Velvet Paw. She will be greatly missed by her family and friends, included the Ya-ya’s. A funeral service will be held at 10:00 AM on Wednesday, February 6, 2019, at Wright & Salmon Mortuary, with a one hour visitation prior. An additional visitation will be from 5:00 PM till 7:00 PM on Tuesday, February 5, 2019, also at the mortuary. Cremation rites will be accorded following the service and disposition of ashes will be at a later time. In lieu of flowers, memorials may be made to Pets for Seniors (www.petsforseniors.org). To send flowers or a remembrance gift to the family of Joanne R. Bergman, please visit our Tribute Store. "Email Address" would like to share the life celebration of Joanne R. Bergman. Click on the "link" to go to share a favorite memory or leave a condolence message for the family.